With a stellar quote from Salman Rushdie himself, Watch Me Go, by Mark Wisniewski, is as tense as it is disturbing. His other works include Show Up, Look Good, and Confessions of a Polish used Car Salesman. 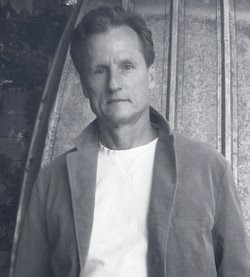 He's also the author of the collection of short stories, All Weekend With the Lights On. (Great titles, right?) I'm thrilled to have Mark here. Thank you, Mark. What sparked the writing of Watch Me Go? What idea was haunting you that pushed you forwards? The notion that someone like Deesh could simply be trying to survive economically--then become imprisoned and hated because his friendships and efforts to merely earn rent backfired--struck me as the underpinning of a potentially tense, suspenseful, and even horror-laden novel. Back when I was in academia, I experienced a chain of events along those lines. A situation like that can, despite your best intentions, keep getting worse, and the number of wise choices available to you keeps diminishing while the stress keeps building. And at some point you know you're in for hell yet you still hope--but trying to fight back or leave simply makes matters worse. In Deesh's case, he is black, and some people out there will always hate him because he's black, and that's an imprisonment he'll never escape--and that horrifies me. The novel is just gorgeously written, and is being called a literary crime novel--which I love, because it elevates the genre, or perhaps, creates a brand new one. Can you talk about this? Watch Me Go took twenty-five years to write and publish, so there were countless drafts and revisions, so in theory--mathematically speaking--it should be five times as polished as a novel that took five years? And yes, that math does assume an oversimplification of how writing works, but there's also a certain logic there, no? Anyway Deesh's and Jan's diction is fairly off-the-street, which some readers would call "anti-literary"--so I'm glad you found some beauty there--that is, in the way they talk. 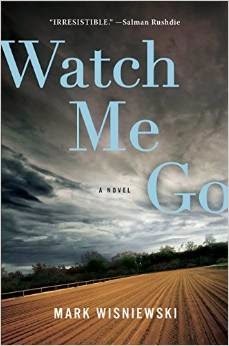 So much of Watch Me Go is about forgiveness, fate, race and justice. I wonder if you can talk a bit about this, as well. I didn't want only to show the horrors of racial and economic injustice. Certainly I wanted to show those horrors--because I think people should quit denying that America's suffered significant backsliding when it comes to race and justice. But I also wanted to show that maybe there's something you and I could do to fight those horrors today. In my mind, WMG says we could do what Jan and Deesh (the two narrators) did: listen well, and then, when someone is listening to us, tell our truths as candidly and relevantly as possible. What kind of writer are you? Do you have rituals? Do you have to drink ten gallons of coffee or have music playing? Do you outline? I'm a binge-writer. It's either up all night writing or off at the racetrack playing. And writing requires that I drink much coffee. And I play music, often loudly. Often the same song or CD over and over. And yes I do outline, am a big believer in outlines, but not necessarily from the very beginning. At the beginning, particularly when the narration's in the first person, I write freely to help myself hear a narrative voice. My next novel. Because for a while there, it was just something Penguin Putnam wanted me to do--but now it's one of those stories in me I need to get out. Who's my long shot in today's 9th at Aqueduct? Illustration by Michael Hirshon for Amazon’s Day One Journal. Jane Hawley is a hoot. 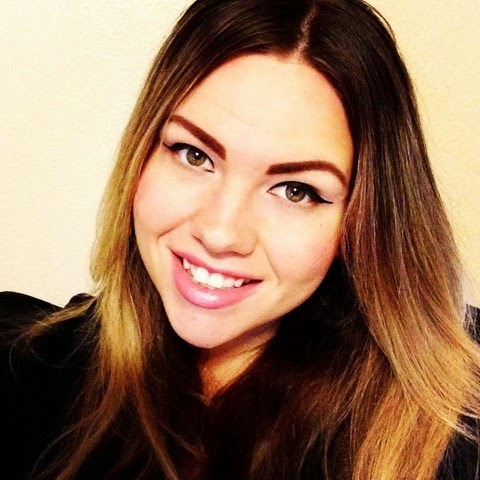 I met her through my good Facebook friend, Nick Belardes, and quickly learned that anyone Nick adores, I'll adore, too. She's currently pursuing an MFA in Fiction at Texas State University, where she serves as the managing editor of Front Porch Journal. 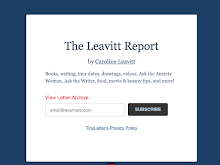 Her nonfiction has been published in both The Pinch and Memoir Journal. 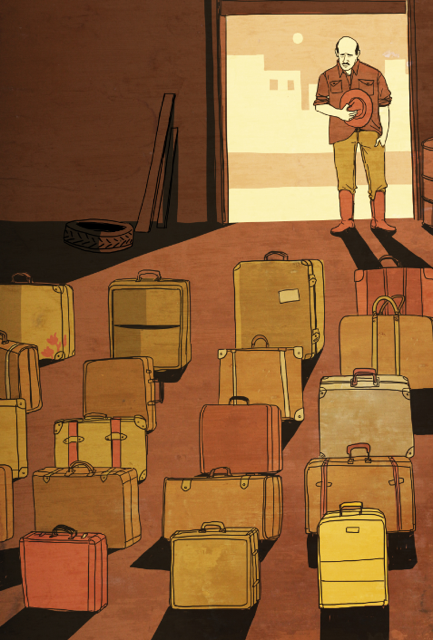 “The Suitcases of San Léon” is her first published work of fiction, and it's extraordinary. I'm so happy to host Jane here! So tell us about your story in Day One--and what does it feel like to see it in there? In “The Suitcases of San Léon,” an empty bus pulls into the depot station. As the workers clean the bus, they find evidence of the passengers’ presence—the urine-soaked seats, the human remains, and the luggage that, along with the passengers themselves, will never make it to their final destinations. The workers understand that the disappearance of the travelers is linked to the drug cartels. The men are tasked with deciding what to do with the suitcases and the moral implications of protecting themselves through silence or risking their lives to speak up as witnesses to the violence. It developed out of an article I read nearly four years ago about a massacre of forty immigrants who were pulled off a bus on Mexico’s Federal Highway 101. People only noticed something had happened once their suitcases started piling up in stations around Tamaulipas. I’m so thrilled to have my work appear in Day One and now as a self-titled Kindle Single. It’s difficult to make a living as a writer and Day One is one of the best paying magazines out there for emerging writers. The editor, Carmen Johnson, was wonderful at working with me to strike balance between my vision for the piece as an author and how readers would receive the story. I also love the cover design by Michael Hirshon. It’s really incredible to see how an artist visually translates the emotions of your story. What kind of writer are you? Do you outline things out messily, or not at all? Do you believe in the Muse? I usually have an image or a character and a distinctive setting in mind when I start a story, but I have no idea what’s going to actually happen so I don’t outline plot until I’ve already written about half of the story. My best work usually comes from asking myself a moral or existential question in conjunction with the images I’m thinking about—that usually provides enough of an engine to the story to propel the writing forward. I do believe in the Muse, but I don’t believe she’s fickle. She’s always there somewhere inside me, though there are times when she speaks more softly so I have to tell myself to clear out some mental space to hear her when I’ve let daily anxieties take over my mind. I’m most creative when I’m alone, or at least when no one is talking to or around me. I guess you could say silence is my muse more than anything else. I’m not supposed to be obsessed about anything right now other than my novel, but I’m already thinking about multiple story ideas to work on next so I’ve been allowing myself to do a tiny bit of research about the young Russian women fighter pilots who chased the Germans back to Berlin during WWII. They were called the “Night Witches” because their planes were old crop dusters that made a whooshing noise that reminded the Germans of a witch’s broomstick flying overhead. I also read some of Wendy Lower’s recently released Hitler’s Furies: German Women in the Nazi Killing Fields, which made me think about what women’s roles have been regarding violence and war both in the past and the present and how those roles have been possibly underrepresented in literary fiction. Your story is so incredibly haunting that I wanted to know what it was like for you during the writing. Was there a moment, when everything changed or surprised you? I had to think about how to tell the story I wanted to tell for a long time. I read a newspaper article years ago about the San Fernando massacres that took place that began with an image of the unclaimed suitcases piled up at bus depots across Mexico. I knew immediately that I wanted to write something about these suitcases. Who did they belong to? What happened to their owners? What happened to the suitcases themselves? I wanted to thread this mystery throughout the story, but I also wanted to meditate on how a community under extreme pressure responds to violence. That’s why I decided to write in the first person plural ‘we’ voice of the bus depot workers. It’s a less common point of view and also one that I’ve always loved to read because there’s automatically a communal aspect built into the story. It was choosing this point of view that changed the story for me. The tone became more elegiac and guilty. The focus of the story shifted from the fear of the cartels to the moral implications of trying to maintain the routines of your daily life when there are so many people dying around you. You're partners with another writer--do you trade pages, give advice? What's that like? I’ve met so many writers who vehemently claim that they could never be in a relationship with another writer but then complain about how their partner never truly appreciates their work or—gasp!—doesn’t even like reading. Having a partner who’s another writer can be difficult—we both get moody or anxious or argue with each other or ignore the housework, and our financial situation can be precarious because we’re both writers. However, I’ve never met someone I can more deeply connect with on an emotional, intellectual, and artistic level. He respects my artistic process and knows how important writing is to me and I do the same for him. We share all of our work and often read to each other or discuss writing problems on a daily basis. He’s more open to sharing early drafts and letting me make suggestions early on in the process. I have a harder time letting mine go until I feel like I’ve incubated the story for long enough. He’s also a more prolific writer than I am so he’s constantly motivating me to write. I think I’m a better writer and person because of him and I hope he could say the same about me. What question didn't I ask that I should be mortified that I didn't? You can order “The Suitcases of San Léon” (for only $1) from Amazon here: http://amzn.to/1L14GwX. You don’t need a Kindle to read the story, just a Kindle app that you can get on your phone or tablet (for either iPhone or Android). Instructions are available for Android here: http://amzn.to/1umoTmu. And for Apple products here: http://amzn.to/1J9f9EM.